Jennifer Stegall, 33, pleaded guilty to aggravated unlawful use of a loaded gun. COOK COUNTY CRIMINAL COURTHOUSE — A woman caught on cellphone video firing a gun into the air multiple times in Lincoln Park in 2015 has been sentenced to two years in prison. Jennifer Stegall, 33, pleaded guilty Wednesday to aggravated unlawful use of a loaded gun by a person who doesn't have an FOID card or concealed-carry license, court records show. Cook County Judge Timothy Joyce sentenced Stegall, of suburban Broadview, to two years in prison. 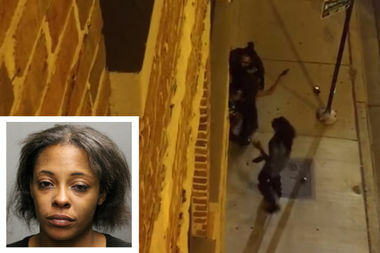 Video of the incident shows a group of people arguing and shoving each other in the 2600 block of North Halsted Street around 2:10 a.m. Oct. 10, 2015. About five gunshots can be heard over the course of the two-minute, 30-second video, in which the group can be seen continuing to fight on the sidewalk and shout at each other. Prosecutors initially charged Stegall with a misdemeanor, but later upgraded her case to include eight felony gun charges. In a plea deal Wednesday, Stegall accepted guilt for one charge; the other seven were dropped. The Lincoln Park resident who posted the video to YouTube, who asked to remain anonymous, said it wasn't the first time he'd seen fighting on the street but that he never heard gunshots in the area before. "It didn't seem like she was firing at anyone in particular," he said. "After about two and a half minutes, my roommate pulled me aside and said, 'Get in the house.' Then I called 911 because I thought: 'Why aren't the cops here yet?' "
Police said they were able to identify Stegall with the help of witnesses. No gun was recovered.